Peanuts are a good food to incorporate into your diet since they contain vitamin E, folic acid, thiamin, niacin, and other healthy antioxidants. Other nuts (in moderation) are also really good to incorporate into your diet, and are believed to help lower cholesterol, and protect people from heart disease and other ailments. So nuts are really healthy but due to their high fat content (it is healthy fat but still high calorie), it is still best to eat them in moderation. For many years I didn't go anywhere near peanut butter when I was dieting, since despite being made of healthy ingredients, peanut butter is high in calories and fat. Then, I discovered Better'n Peanut Butter in my local Trader Joe's, a healthy low calorie butter "alternative". 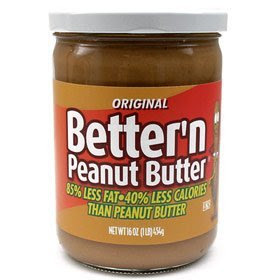 A two tablespoon portion (32 grams - enough to spread pretty liberally across two pieces of toast) of Better'n peanut butter has 100 calories, 2 grams of fat, 4 grams of protein, and 2 grams of fiber (2 weight watchers points!) -- significantly less fat than most peanut butters (peanut butters often have ~200 calories and ~16 grams of fat per serving). And, Better'n peanut butter tastes great, since it is still made from peanuts (they are just de-fatted). Better'n Peanut Butter comes in three flavors: original, low sodium, and chocolate. The low sodium flavor is saturated fat free, gluten free, dairy free, cholesterol free and preservative free! I don't know the nutritional information for the chocolate nor have I tried it, so please let me know if you have. You can buy Better'n Peanut Butter at Trader Joe's. If you don't have a Trader Joe's near by, check out the store locator on the Better'n Peanut Butter website. You can also buy it online from Amazon. In case you need some inspiration for what to do with it -- try spreading the peanut butter on a low calorie english muffin, combining it with honey on a low calorie crumpet, dipping some healthy apples into it, or even eating with some sliced bananas in a soft wrap. While I love my Better'n Peanut Butter, I've also recently discovered delicious powdered peanut butter as well which is great for cooking! I'll post about that soon. would my husband like it? sit thru it? ok, please to return back to your original programming. I went to see the movie on V-day too and loved it! It made me cry many many times. I had this PB, it's really good. I love that BetternButter Peanut butter, but I've never seen the chocolate. That would be interesting. I also like the Naturally More peanut butter. Mmmm peanut butter. I had about 1/2 cup of chocolate PB2 (the powdered peanut butter) tonight for a snack. It was so good that I just kept going back for more... hehehe. I really wanted to like Better'n Peanut Butter when I tried it a few months ago...but blech, I thought it tasted way too sweet and weird. But I really like PB2--that stuff is a miracle! I'll have to try the Trader Joe's as their stuff is always wonderful. I have the PB2 at home, and think it's delicious. I spread it on a celery stick or just eat it plain when I'm jonesing for peanuts or peanut butter. I bet it would be great in a smoothie, too, and only 27 calories per TBSP! I third (fourth? ...fifth?) the sentiment about PB2. That stuff is AMAZING. And they're currently trying to formulate a sugar-free version! It's completely worth the shipping fees. Hey Natalie -- Yep you are right. I wish that I ate all non-processed foods, but I'm just not in a place where I can eat perfectly all the time (I have a really busy job and I am not always able to cook). That is why I have my ingredient rules (no hydrogenated oils, no artificial sweeteners, no sugar alcohols, and no high fructose corn syrup). It isn't perfect but it helps steer me towards better choices, even when I don't have a lot of time for prep. I dream of a day when I can go completely raw/natural. It will happen someday! When I was trying to loose (more than a little) weight a few years ago, I ate a TON of this stuff! Nowadays, a find that I prefer it in recipes, instead of on its own. I am very late in this article, but I recently gave this peanut butter a try. It was a disappointment because it was in a bag that I dropped and the jar cracked. I desperately saved parts of the peanut butter that did not touch the glass because it was a freaking $8 at Target! Anyway, the taste really depends and how healthy you want to eat. This DOES have less calories than the average peanut butter, but it has a lot more different ingredients, not just salt, oil and peanuts. Personally, I think this peanut butter tastes good, but not everyone is going to enjoy it because it does not taste close to actual peanut butter; it tastes more like a sweet and desserty flavor. It also has a very nasty aftertaste. Also, a minor disappointment was the fact that it had to be refrigerated once it was open.. I always forget. 2) In my opinion, if you are looking for peanut butter, this tastes almost nothing like it but still tastes good to me. However, the aftertaste tastes like you just had cheap candy. 3) If you are choosing natural, whole foods and worry for your health, this does have less calories, but at the same time, contain way more ingredients than peanut butter.